Here’s a secret: I actually like the Ferengi episodes. What I found for the most part was that the more ‘passionate’ fans were not big fans of the Ferengi episodes. The people I’d meet on planes who just watched the show, they loved the Ferengi episodes. They didn’t see it as being untrue to the canon, or as, you know, doing the type of show that Star Trek is not supposed to be doing. They seemed to like them. I’ve never subscribed to the idea that Star Trek needed to take itself too seriously. This is a science-fiction show, capable of being just about anything. It can do adventure, it can do mystery, it can even do romance and drama. The most successful of the first ten Star Trek films was a fish (or whales) out of water comedy, so it’s not impossible for the franchise to bring the laughs. So it’s possible, but how likely is it? The original Star Trek probably had the best sense of humour of any of the Star Trek shows. It produced a number of comedy-heavy hours that can be measured among the best in the series (including Tomorrow is Yesterday and The Trouble With Tribbles), and often ended episodes with a nice scene of the three leads joking and laughing together in an entirely casual manner. I think it’s fair to say that The Next Generation wasn’t nearly as clever in its application of humour. The cast just seemed too much like straight arrows, and the show’s only truly successful comedy relief – the character of Q – worked because he played so well against that dynamic. While The Next Generation eventually learned to make the most of Michael Dorn as the franchise’s loveable straight man, it never quite pulled off the comedy episodes with anything approaching the success of its predecessor. Deep Space Nine, for its part, would feature some of the best dramatic storytelling in the franchise. 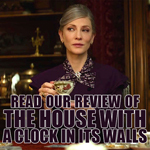 However, I’d argue that it also had the best sense of humour of any of the spin-offs. It never quite pulled off the casual humour that Shatner, Nimoy and Kelley brought to Star Trek, but the series could do comedy episodes quite well. Little Green Men, Our Man Bashir and even The Magnificent Ferengi are great fun. It’s impossible to imagine any other cast pulling off Trials and Tribble-ations half as well. 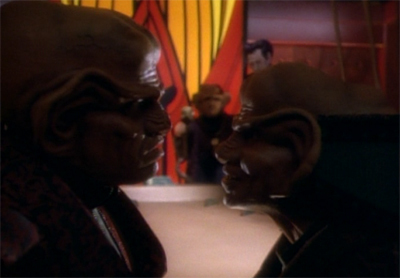 The Nagus is really our first proper look at a Deep Space Nine comedy episode, and it’s not a bad first attempt. 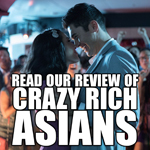 The actors are still settling into their roles, and the series never seems quite how far it can venture into the realm of pop culture parody while remaining Star Trek, but it isn’t embarrassing. 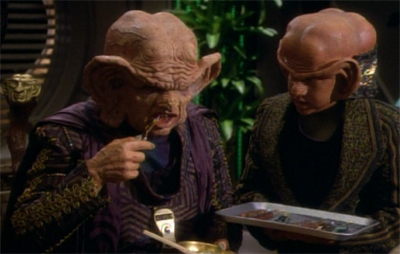 It is occasionally quite funny, largely down to the skills of Armin Shimerman as Quark and Wallace Shawn as Zek. Max Grodénchik would grow into part of the show’s comic relief, but Rom isn’t quite there yet as a character. The writing talent on that show was extraordinary, and Michael Piller was just an unbelievable mind, and an unbelievable story mind. He’d been a journalist and he had such creativity as a television writer. So we’re sitting around talking about the business part of the story. Ira Behr was there. Michael was there. 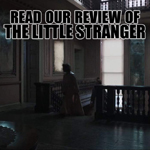 I’m not sure who else was there from the writing staff. But Michael said – and I’ll never forget this – “Well, let’s do The Godfather.” Everybody’s eyes lit up and they all said, “Yeah, of course. Let’s do The Godfather!” Michael pointed to Ira and said, “Ira, you write it,” and Ira wrote it. So, we did The Godfather. 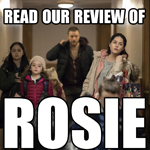 When I read that finished script I died and went to heaven. And the only thing I contributed to The Godfather part was the name Zek. That’s it. It actually fits quite well. Gangster stories are traditionally seen as the dark side of the American dream, unchecked capitalist ambition with no concern for society as a whole. The is precisely what the Ferengi came to represent in Star Trek. However, “doing The Godfather” as a first-season comedy episode of a science-fiction spin-off… that takes ambition. And I’ve admitted before that I’ll forgive the first season of Deep Space Nine quite a lot for its ambition. And, to be fair, The Nagus doesn’t even try to hide its inspiration. There’s even a scene constructed as a direct homage to the iconic opening of Francis Ford Coppola’s epic, a polite acknowledgement of the episode’s roots, transposed to a science-fiction sitting. 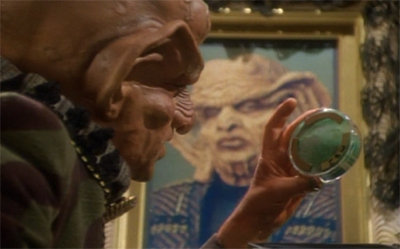 As Quark listens to appeals, stroking a… something, he offers sage advice which might seem familiar to any film buff. “Yet, now you call me Nagus. But is it out of true friendship? No. You only pretend to show me respect so I will grant you this immense opportunity.” The production team even put up blinds on the window to complete the reference. It’s a lovely scene. But I’m getting ahead of myself, as I tend to do. Let’s talk about the Ferengi. They were originally introduced in the first season of The Next Generation to serve as potential new bad guys to replace the Klingons and the Romulans. They were even name-dropped in the first episode, Encounter at Farpoint, as a potential rival to the Federation, prone to eating their business partners. That’s not bad, a smart way of building the credibility of a threat before a debut appearance. The Art of Star Trek takes the criticism a bit further, quoting Shimerman again that the Ferengi were treated as little more than “angry gerbils.” Although the show would make a couple more half-hearted attempts to turn the Ferengi into credible villains (none of them great), it was clear that things weren’t working out. The Next Generation promptly introduced the Borg, who worked much better as the villains of a major science-fiction show, shunting the Ferengi off to one side. So, again, Star Trek makes it possible for its core group to appear as care-free economic innocents by projecting the traits of greed, calculation and exploitation – which are, extrapolating from the present state of the world, prerequisites for any technologically advanced society with a high standard of living – onto an evil alien. 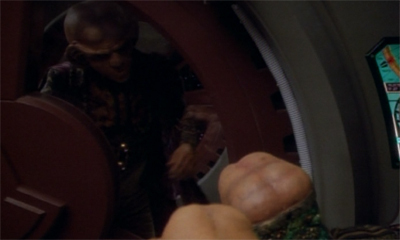 The question remains why this mechanism was so successful with the Borg and why it flopped with the Ferengi. I suspect that primarily the visual coding of the Ferengi made them a failure as villains: their small size, their clumsy looks with bad teeth and big ears, and their armament with whips – vis-a-vis the Federation’s high-tech phaser weapons – make them little convincing as a threat. However, one might also speculate that the Ferengi never came across as all that threatening because the characteristic they personify is not as central to the cultural narratives underlying Star Trek as the ones the Borg stand for. Both American national narratives and many multicultural discourses largely ignore class as a significant social factor. In other words, there is no cultural need for Star Trek to displace class because it has already been repressed by much more basic and overarching discourses. It’s a fair point. “Evil capitalists” is a tough sell for the antagonists of a science-fiction show, although one senses they might be much more relevant today. 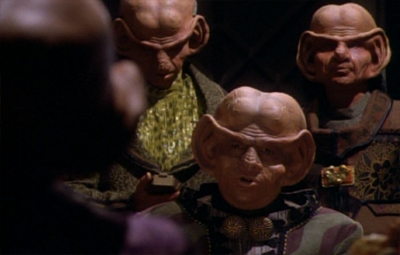 Most notably in recent times, the Ferengi are, by some viewers, read as representing stereotypes of Jewish people. 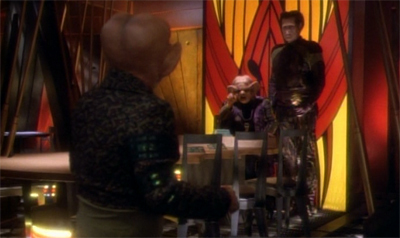 Contributors to “Trek Cochavim,” a Jewish Star Trek-discussion group, hotly debated the question whether the program’s portrayal of Ferengi culture – its reverence for money, its clannish structure – is based on anti-semitic stereotypes (Greenwald, 104). Again, Star Trek provides for sufficient estrangement of “real” ethno-racial stereotypes to maintain an air of deniability around such charges of anti-semitism – yet they cannot be entirely dismissed either. 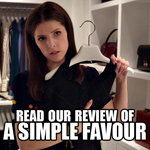 It’s hardly an unreasonable criticism. After all, the Klingons were originally introduced in Errand of Mercy as “hard-faced, Oriental” warriors with Fu Manchu beards. Star Trek hasn’t always been the most sensitive of shows when it comes to racial politics, and it’s no surprise that some of the more shallow portrayals tend to provoke this sort of criticism. Imagine the wrangling had Star Trek: Voyager successfully executed its original idea for the Kazon – “at least two gangs, Crips and Bloods, in competition for influence.” Imagine the racial politics that would have popped up there! However unfortunate some of the implications might have been, Star Trek generally managed to overcome some of the troubling connotations by developing these alien species into more than just a collection of generalised racial attributes. The Klingons become more than just foreign communists over the course of The Next Generation, and the Ferengi would become more than just a bunch of greedy bad guys over the run of Deep Space Nine. It’s just I thought the Ferengi were really cool characters and gave us a totally different feeling. We had so many f—king heroes. It was nice to have people who were like us, scared and looking out for themselves. He has a point. In a universe full of idealised characters, the Ferengi are arguably a lot closer to contemporary humanity than we’d like to think. The Nagus is a comedy episode, first and foremost. 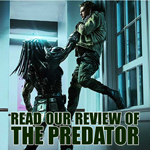 So some plot logic and character work takes a back seat to cheap gags. “I’m old,” Grand Negus Zek laments at one point. “The fire dims. I’m just not as greedy as I used to be.” It’s an absurd line, and one that only exists to underscore how greedy the Ferengi are, and how that is really their sole defining character trait as a race – the pursuit of profit no matter what the cost. Behr spends quite a great deal of time admitting that the Ferengi have not been well-handled in the past. 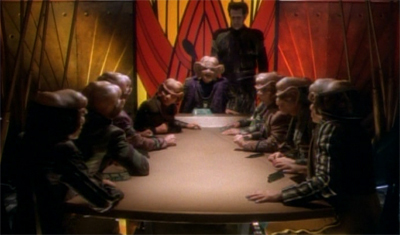 Holding a big Ferengi business meeting, he complains that their reputation is holding them back. Leaning a bit on the fourth wall, to the point where he might as well ask the audience for a fresh start, he observes, “Nevertheless, it is becoming more and more difficult to find truly lucrative business opportunities here in the Alpha Quadrant. And why? Because no matter where we go, our reputation precedes us.” Behr seems to concede that the Ferengi have been a bit crap in the past, but he’s going to start working on it right now, if you let him. It originally seems like a nice gag, but it is something a little bit deeper. 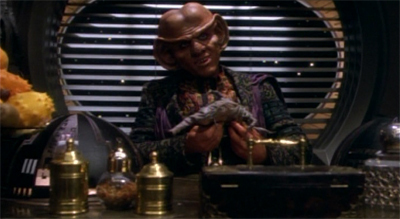 It’s an insight into just how deeply engrained commerce is in the Ferengi society. It’s one last business deal for the deceased, and a way of measuring their accomplishments in the only way that matters to a Ferengi – monetarily. Just as the Klingon devotion to action is reflected in their rejection of the inert matter of a dead body, the Ferengi capitalist culture finds its ultimate expression in the sale of the body after death. It absurd to us, but it adds a bit more depth to the Ferengi. It starts to hint at some shading and development. 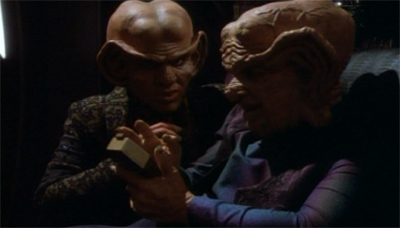 The Nagus also officially introduces the concept of the “Rules of Acquisition”, the laws governing Ferengi interaction. Behr would publish the rules in a little novelty book during the show’s run. I own a copy. 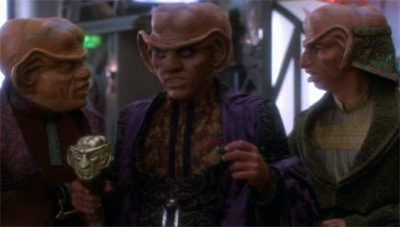 It’s notable that the Ferengi are one of the relatively few Star Trek races to support tie-in materials dedicated expressly to expanding their culture, mythology and systems of governance. Only the Klingons can really compete. Anyway, the Rules are important. They suggest that the Ferengi aren’t simply governed by one-dimensional greed and by pure avarice. The presence of the Rules of Acquisition suggests that an entire culture has grown up around the accumulation of wealth, guided by their own cultural norms and principles. 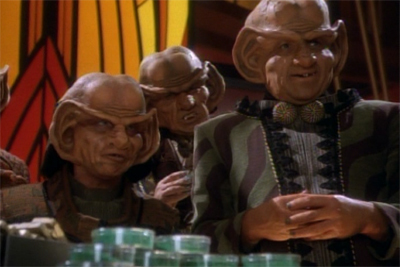 The Ferengi aren’t just money-hungry profiteers, they are an entire society build on the notion that profit is a good thing. 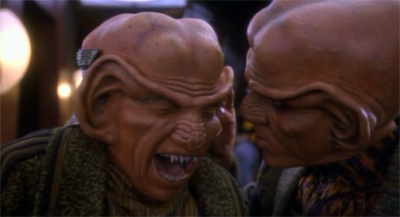 Ferengi culture isn’t built on violence. In fact, violence is counter-productive. “You don’t grab power,” Zek advises his son. 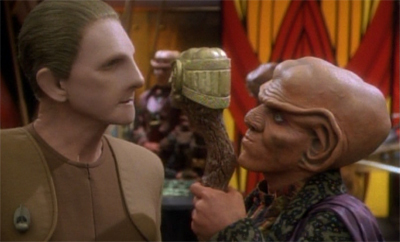 “You accumulate it quietly without anyone noticing.” Referring to Quark, Zek suggests that information and manipulation are the keys to success – implying the Ferengi way is one more shrewd than simple violence or brutality. “You could have let him hold the sceptre while you controlled everything from the shadows. And then, when everything was running smoothly, only then would you take over.” The Ferengi are, in their own way, no more violent than the Federation, they just stick to their own principles. Behr has always had a knack for playing with and subverting Federation ideals, and one of the nicer touches of The Nagus is the suggestion that the problem in relations between the Federation and the Ferengi is not the Ferengi. 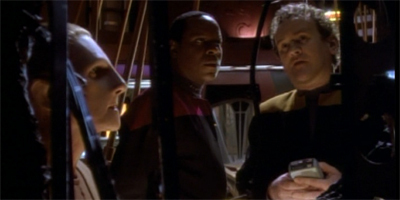 Already, Deep Space Nine has begun building up little threads and subplots, and developing characters and attitudes. It is already quite clear, for example, that Sisko has no patience for the Ferengi way of life. He dismissively referred to Nog as “the Ferengi boy” in Move Along Home, and was worried about Jake’s friendship with a Ferengi. It’s worth noting that Sisko’s attitudes are hardly unique in Star Trek. 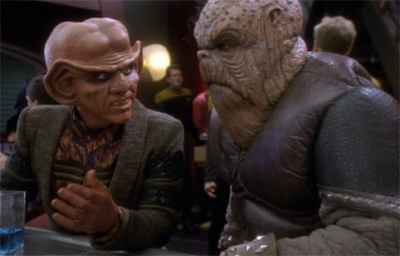 On The Next Generation, the characters tended to treat the Ferengi with a mixture of contempt and condescension. While Picard and his crew estolled the virtues of peaceful understanding of Klingons and Romulans, there was generally a sense of revulsion towards the Ferengi. Sisko’s prejudice here isn’t unusual. In fact, it’s treated as something of the norm. 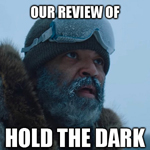 Until Jake calls him on it. It seems like a reasonable enough excuse, if you don’t think about it too much. Then you start to wonder a bit. Surely the Ferengi are more like modern humans than any other species in the Star Trek cosmos? If we can relate to Vulcans, why not the Ferengi? 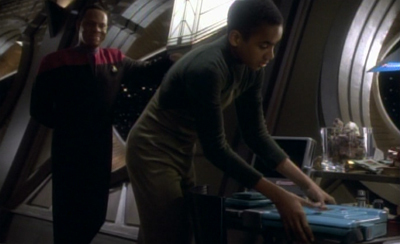 There’s a lovely little scene where Sisko discovers what Jake has been doing with Nog. 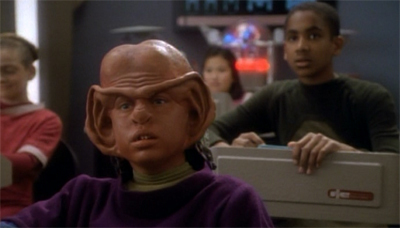 Sisko’s son has been teaching “the Ferengi boy” how to read, forging his own common bond. It makes a very clear point. 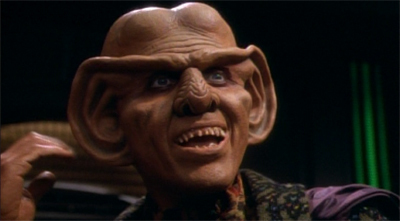 The Federation’s attitude towards the Ferengi has been condescending and patronising, rather like that of the franchise itself. There are lots of nice touches, even beyond watching the first attempts at rehabilitation of the Ferengi. We get the first real sense that Odo might care for Quark, as he lets genuine concern creep into his appeal for Quark’s assistance in finding the attempted assassin. “When are you going to get it through your twisted little brain that we are trying to save your life?” Auberjones does wonders with the line, which maintains the pretense that Odo is more frustrated than concerned, but still hints at the depths of their relationship. Rom feels a little strange here, given his later portrayal on the show as a bumbling idiot. Rom’s willingness to assassinate his abusive brother feels quite sinister for a story like this, and it’s really hard to imagine where else that portrayal of Rom could go. Would you still work with him, even if he was your brother? This episode also marks the only appearance of Krax, the son of Grand Nagus Zek, who is never mentioned again. Despite the fact you’d assume he’d be a major part of some of the upcoming Ferengi stories. Aside from those two anomalies, The Nagus actually feels quite significant in hindsight. In one of those nice father-son conversations that show does so well, Sisko casually mentions the Bajoran Gratitude Festival and the Fire Caves. (Well, “Fire Caverns.”) Both would become important, but not in the short term. 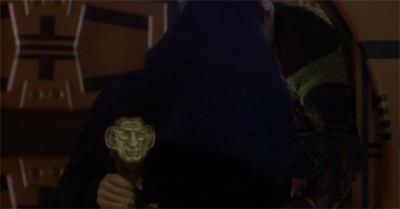 The Bajoran Gratitude Festival would appear as part of the third season episode Fascination. The Fire Caves would next be mentioned in the fifth season episode The Assignment and would appear in the finale, What You Leave Behind. The Nagus also marks the only time we hear Morn make a sound (he laughs! ), and the aforementioned first reference to the Rules of Acquisition. So there is a sense of a building continuity, even though these elements won’t necessarily be developed for quite some time. It is good to get a sense that the show is developing these little themes and ideas that are mentioned casually and then build up over time. It’s still early, but The Nagus feels like a step in the right direction. It’s not perfect, though. The comedy is a little forced in places. 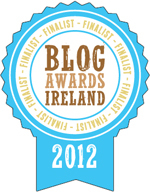 The laughs aren’t belly laughs so much as wry smirks. However, it treats the Ferengi as more than just a stereotype, and represents a significant step forward for Deep Space Nine. Much done, more to do, but this is a good enough start for now. 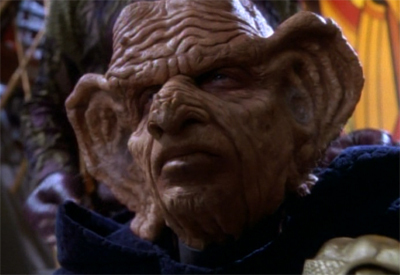 The Nagus is one of the strongest of the season, despite the reputation that the Ferengi episodes would earn.